The novel “Fossil Hunter” by Robert J. Sawyer was published for the first time in 1993. It’s the second of the Quintaglio Ascension trilogy and follows “Far-Seer“. It won the Homer Award as best novel of the year. “Fossil Hunter” begins several years after the end of “Far-Seer”, when Afsan and Novato’s children are adults. The Quintaglio society has been profoundly changed since Afsan’s discoveries, mainly because he showed that the world, a moon of a gas giant planet, will be destroyed because its orbit is slowly decaying bringing it closer and closer to the planet until its powerful gravity will tear its moon to pieces. Reading the first novel is useful not only to appreciate the development of protagonists such as Afsan and Dybo but also the changes that occurred and are taking place within the Quintaglio society, which have a series of consequences. Although less than 300 pages long, “Fossil Hunter” includes a number of subplots, one concerning Emperor Dybo, others concerning Afsan’s children of which one is a mystery in which Afsan is investigating the death of one of a daughter. “Far-Seer” is a strongly allegorical novel in which Aslan is a sort of Galileo whose astronomical discoveries clash with the Quintaglios’ religious faith. His son Toroca is a sort of Charles Darwin who during his travels discovers the principles of the evolution of the species but that is only one of the themes of “Fossil Hunter”. 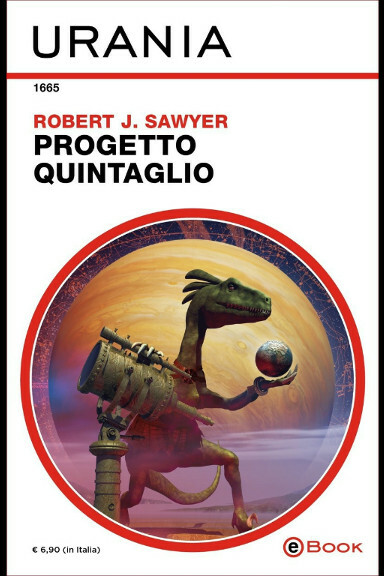 This novel greatly expands the fictional universe in which the trilogy is set: the first novel tells a key period in the history of the Quintaglios only from their point of view, in the second there’s also the story of the Watcher, told in the first person as a sort of report of his deeds. In “Far-Seer” nothing is said about the origin of the presence of tyrannosaurs, along with other species recognizable as dinosaurs and reptiles, on the moon of a gas giant planet because the Quintaglios believe they were created there by a Goddess. In “Fossil Hunter” the Watcher tells his story, the history of the Crucible up to that of the Quintaglios, the descendants of Nanotyrannus lancensis. The Watcher also tells part of the history of the Jijaki, descendants of Opabinia regalis and I’d have liked Robert J. Sawyer to have added more information about them, given that in the tree of life they’re so far from humans that in comparison dinosaurs are rather close relatives. Howerver, I understand that the author added them for reasons that become clear during the novel and not to tell their story, but the Cambrian period organisms particularly fascinate me. The set of subplots makes “Fossil Hunter” complex but in my opinion well balanced and various themes still have room for development. Some subplots have their own conclusion but others reach important events that make it necessary to read the third novel of the trilogy. It confirms the positive impression I had of “Far-Seer” so if you liked the first novel I recommend this sequel as well.